While the rest of the country is still thawing out, springtime in Mesa is beautiful, with average temperatures just under 80 degrees. So, while everyone else is becoming tired of wearing the same pile of layers day in and day out, we get to transition to shorts, t-shirts and sandals (which, let’s be honestly, Arizonans really never put away to begin with). With this beautiful sunshine that comes out to play, so many of the best festivals here happen in the springtime! Check out our round-up of some of our favorite festivals during spring! 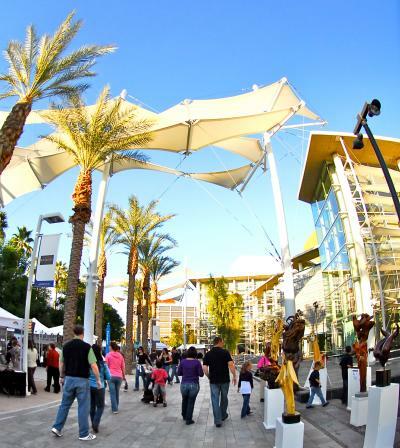 Shop for beautiful art, jewelry, soaps and more made by local artists and crafters here in City Limitless® at the Downtown Mesa Festival of the Arts in Downtown Mesa. This outdoor art show goes from 10 a.m. to 4 p.m. on the first and third Saturdays of every month through April 16. The Gilbert Global Village Festival is a multi-cultural celebration for all ages on April 9 from 10 a.m. to 4 p.m. The 12th annual festival will celebrate community while highlighting traditional and contemporary forms of dance, music, children’s activities, arts & crafts and ethnic foods from various countries. Enjoy the fun of the springtime season with this free outdoor event in Queen Creek! From live entertainment and an egg hunt to a community yard sale and kids’ marketplace, the whole family is sure to have a hoppin’ good time at Spring into QC! In addition to a bunch of opportunities to play, families can even get a “Taste of QC” with samples from local restaurants. For juicy, fresh peaches, you can’t miss the Peach Festival at Schnepf Farms on May 16-17 and 23-24. In addition to being able to pick your own peaches, there are lots of activities for everyone including orchard hay rides, live music, carousel rides and more. Plus, there’s always plenty of peach pie, peach cinnamon rolls, peach cookies and peach cobbler! 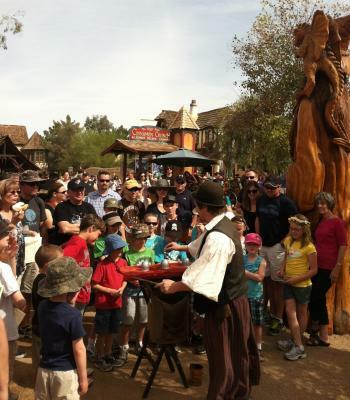 On weekends through March 27 you can enjoy the springtime weather and experience a true medieval faire at the Arizona Renaissance Festival. With jousting, turkey legs, jovial comedy and artisan crafts, there’s always something going on. The 2nd Annual Downtown Mesa Brew Fest is a must-visit for beer connoisseurs and lovers visiting City Limitless. From 2-6 p.m. on March 5, Macdonald Street in Downtown Mesa will be filled with local Arizona breweries and eateries. Aside from beer, there will be local live music and vendors, so you can rock the afternoon away! The festival is free to enter and family and dog friendly, too. Beer tickets are available for purchase at the event for $5 each for a full 12 oz. pour. So pack your sandals and sunglasses, and get out and enjoy this beautiful springtime weather! We certainly are! And don’t forget to share your sunny springtime pictures with us using #MesaCityLimitless for a chance to be featured on social media.